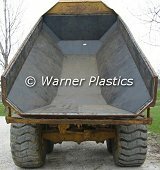 UHMW Combo or Combination Liner: This liner is a reprocessed UHMW liner and it is specifically manufactured for you and your hauling needs. No matter what you haul or how much you haul, your liner will always wear out in the back first. Our UHMW Combo Liner takes care of that problem by making the back 1/3 of your liner thicker than the front 2/3. Popular UHMW Combo Liner sizes are 1/4" (front) & 3/8" (back) and 3/8" (front) & 1/2" (back). The advantages of a Combo Liner are reduced cost and weight. *We can cut or have plastic made to your specifications.